Dr. Kramer’s current research interests are focused on understanding the relationships between spinal cord injuries and neuropathic pain. Historically, pain has been measured from “yes or no” scores generated from pinprick stimulation. This approach, however, represents only one way that peripheral touch can be interpreted by the spinal cord sensory pathway. Dr. Kramer has made several important contributions to the validation of a newer technique known as Contact Heat Evoked Potential stimulation (CHEPs). CHEPs provides recordings of electrical signals reaching the brain, allowing complementary information regarding the spinal cord sensory pathway to be identified. As part of Dr. Kramer’s ongoing research program, advanced neuroimaging and quantitative sensory testing techniques will continue to be developed to better understand how changes in the central nervous system (CNS) relate to the development of neuropathic pain. Using large SCI datasets, he is exploring the relationship between pain, neurological recovery, and other secondary health outcomes (e.g., cardiovascular disease). His research program will enable implementation of novel interventions aimed at improving outcomes and quality of life for people with SCI. 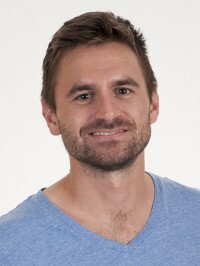 Dr. Kramer is an Assistant Professor with the School of Kinesiology at the University of British Columbia. He majored in Kinesiology for his B.Sc. undergraduate degree major at the University of Calgary, and then turned his focus to neuroscience for graduate research. He obtained a M.Sc. degree from the University of Western Ontario and completed his Ph.D. at the University of British Columbia. Dr. Kramer spent the next two years as a postdoctoral fellow, first at the Spinal Cord Injury Center in Uniklinic Balgrist (University of Zurich, Zurich, Switzerland), and then as a Senior Research Fellow at the Hulse Spinal Cord Injury Laboratory in the Shepherd Center (Atlanta, Georgia, USA). Dr. Kramer is working closely with Dr. Corree Laule to integrate advanced anatomical MRI into the assessment of damage in the spinal cord after injury. The goal of this collaboration is to leverage Dr. Laule’s experience in the field of Multiple Sclerosis, and translate new imaging techniques into the field of SCI. He hopes to begin collecting data in individuals with SCI in the next few months. He also has collaborations with colleagues at the University Hospital Balgrist in Zurich, Switzerland. Dr. Kramer’s research has repeatedly shown that spinal cord sensory pathways can be examined with a variety of quantitative techniques sensitive to minor changes in sensory impairments. Furthermore, his work using evoked potentials has shown improved potential for tracking changes in sensory function corresponding to individual spinal segments. He is in the process of finalizing plans for his next phase of research efforts with Dr. Corree Laule. Questionnaires to assess neurological function (e.g., International Standards for the Neurological Classification of SCI). Interested students should contact Dr. Kramer with inquiries. Jutzeler, CR et al.. 2019. New life for an old idea: Assessing tonic heat pain by means of participant controlled temperature.. J. Neurosci. Methods. doi: 10.1016/j.jneumeth.2019.04.003. Scheuren, PS et al.. 2019. Tracking Changes in Neuropathic Pain After Acute Spinal Cord Injury.. Front Neurol. doi: 10.3389/fneur.2019.00090. Cragg, JJ et al.. 2019. A Longitudinal Study of the Neurologic Safety of Acute Baclofen Use After Spinal Cord Injury.. Neurotherapeutics. doi: 10.1007/s13311-019-00713-8. Jutzeler, CR et al.. 2019. Sensorimotor plasticity after spinal cord injury: a longitudinal and translational study.. Ann Clin Transl Neurol. doi: 10.1002/acn3.679. Rosner, J et al.. 2018. Not Hot, but Sharp: Dissociation of Pinprick and Heat Perception in Snake Eye Appearance Myelopathy.. Front Neurol. doi: 10.3389/fneur.2018.01144.